Launceston assistant coach Tom Rawlings hailed his side's fighting spirit after a 27-23 win over London Irish Wild Geese boosted their chances of escaping relegation from National Two South. 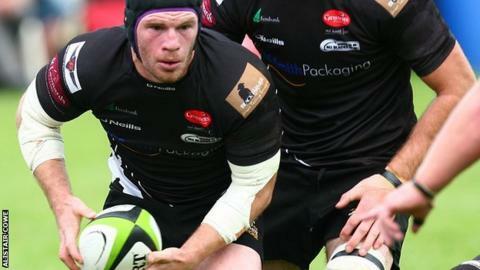 The Cornish All Blacks are two points clear of the final relegation place following the win at Polson Bridge. "The pressure's been on us a lot and I want to credit every man wearing a black shirt because they stepped up. "It's a massive weight off the shoulders," Rawlings told BBC Cornwall. A win over Shelford in their final game of the season will ensure Launceston stay in the division. "We are fighting for our lives next week," Rawlings said. "We want to deliver in that shirt for the supporters who are very loyal and have stuck by us and lifted us when times are down. "We've got another 80 minutes of rugby to decide what our fate is and I know what I'm going to do and what everybody in that changing room is going to do and that's to put our bodies on the line for those 80 minutes." Tries from Lewis Webb and Kieron Lewitt, who also converted both and added a penalty, put Launceston 17-13 ahead midway through the second half, before Irish put their noses in front when Oscar Thomas went over. But Lewitt kicked a penalty and converted Rawlings' 68th-minute try to seal the victory.